It’s a busy time in the coffee world right now. As London Coffee Festival closed on Sunday, so UK Coffee Week begins today. UK Coffee Week brings coffee lovers together to raise funds for the communities that grow the coffee they enjoy, whether that’s the coffee shops or their customers. 100% of money raised goes to Project Waterfall, an initiative dedicated to bringing clean water facilities to coffee growing communities. Over 500 billion cups of coffee are consumed globally each year, meaning that initiatives like Coffee Week is an opportunity to make a positive impact on the communities that grow our coffee. 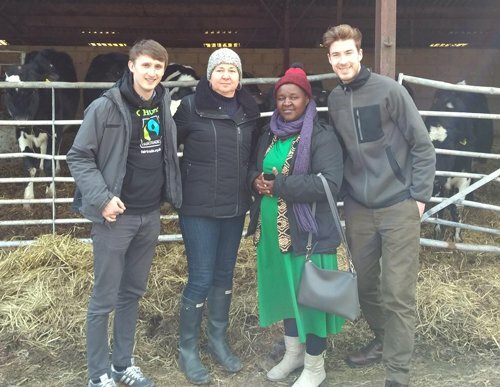 In planning our recently launched Coffee & Cows campaign, we were very aware of the similar challenges faced by both coffee growers overseas and dairy farmers here in the UK. But a visit to a Free Range Dairy farm, by Ketra Kyosimirre from a Ugandan Coffee Cooperative, during Fairtrade Fortnight, gave us a much better understanding of how a fair price for their coffee and support through initiatives UK Coffee Week ensures a better life for their families, whilst improving facilities within their communities. Our campaign wants to highlight the important part milk plays in delivering great coffee and win recognition and value of the farmers and cows that produce it. Traditional family farms producing milk here also need to earn sufficient reward to enjoy a reasonable standard of living and to be able to invest in the upkeep of their farms and the surrounding countryside. We commissioned a YouGov poll recently and 84% of people surveyed, who bought a cup of coffee in a coffee shop, said it was important to them that coffee shops sourced their coffee beans from sustainable sources. When asked similar questions about the provenance of cows’ milk offered in coffee shops, the same number of respondents (84%) said that it was important for them to know that the milk came from farms where cows are assured high welfare. In addition, 84% also said it was important to them that coffee shops sourced their cows’ milk from suppliers who pay a fair price to dairy farmers in the UK. It shows that each cup of coffee being bought in this country directly impacts on farmers here and overseas. We often ask people to “Drink Responsibly” when they buy milk, because we want people to understand how the milk choice they make can shape positive changes in how milk is produced. Milk and coffee are perfect partners and that’s why we want to show our support for coffee farmers during UK Coffee Week. To take part in our UK Coffee Week competition, you simply need to take a picture with one of our Coffee & Cows posters or leaflets and post it on social media using the hashtags #PasturePromise and #UKCoffeeWeek. We will donate £100 to Project Waterfall in the name of the winner. Our dairy farmers will be supporting the coffee farmers and we hope you will join in too.